Retired air traffic controller, currently a full time Grand Dad. My father was in the US Air Force and I grew up around all the Korean and Vietnam Nam era aircraft. I was a mechanized infantry officer and served in Germany during the late 70’s. My primary modeling interest is aircraft, then armor, science fiction, with a few figures and ships thrown in. I choose Goofy as my original avatar because it’s a Christmas ornament that my 5 year old grandson brought to me with the head broken off and no arm between the hand and the shoulder. After he announced that “Papaw can fix anything” I’d like to thank Drill Bit City, Evergreen round stock, super glue and Floquil Reefer Orange for not exposing my feet of clay just yet. 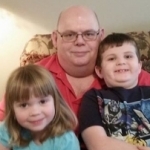 My new avatar is my two grandchildren and I at our Christmas dinner 2014.